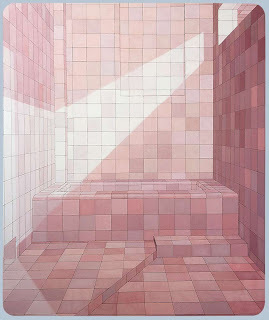 Adriana Varejão is an important contemporary painter, born in 1964, in Rio de Janeiro, she is interested in art from an early age. 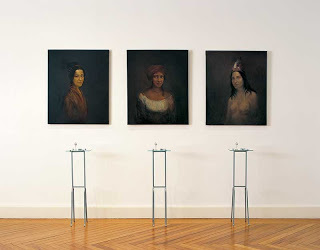 However, she started working as an artist after attending free courses at the School of Visual Arts of Parque Lage in Rio de Janeiro, it was there that she came in contact with the “80 Generation”, a group of artists who retook the painting. 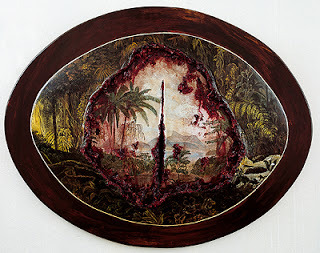 In 1985, she produced the series “Prehistoric” through which she received the Acquisition Award at the IX National Salon of Plastic Arts at Funarte in 1987, thus it she was inserted in the national art scene. 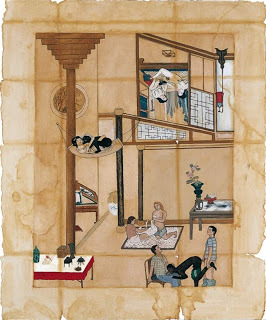 At the same time, motivated by her painting professor Charles Watson, the artist begins the practice of tai chi chuan with Chinese Master Hsin Shan Hu, with that she is led to the study of Chinese philosophy and ceramics, especially the Song period whose broken surface and chromatic tones surprises her, she incorporated this reference in her “bronken” paintings in the late 1980s. 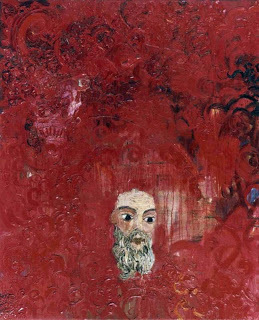 The year 1987 was when she came into contact with a key element of her work, the Baroque period through books about churches and a trip to Ouro Preto. 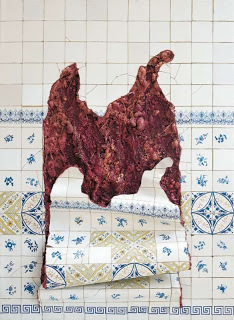 Under this influence, she produced the series “Barrocos” which participates in the exhibition “New New” at the Gallery of Centro Empresarial Rio Botafogo and held her first solo show at the Contemporary Art Thomas Cohn also in Rio de Janeiro. 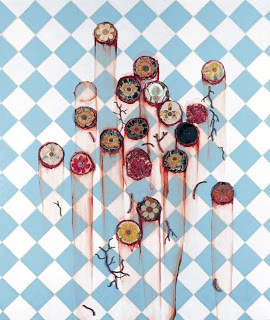 Her international fame occurs after the collective exhibition “U-ABC” at the Stedelijk Museum in Amsterdam and the Calouste Gulbenkian Foundation in Lisbon in 1989, as well as “Viva Viva Brazil” in Liljevalchs Konsthall in Stockholm in 1991. 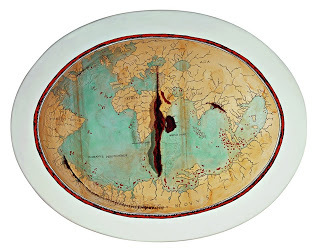 Adriana initiates the series “Terra Incognita” and “Seas and Tiles” in 1991. 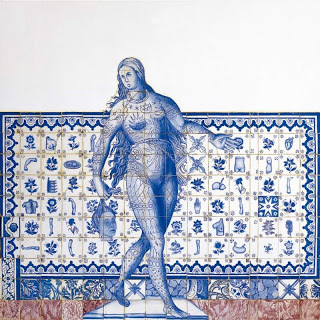 The interest started in “Seas and Tiles”, the tile comes a lot of the residence that she attended in Maceió in 1993 promoted by the Institute Goathe with Brazilian and German artists. 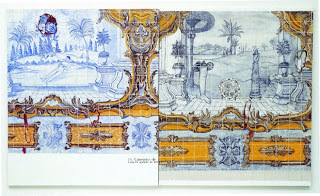 She explores color, symbolic and inherent qualities of colonial tiles. 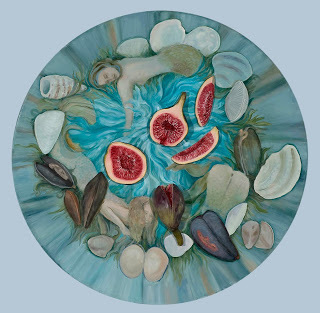 This element fascinates the artist, for its drama and chromaticity, she uses as a backdrop and theme of her paintings covering a wide range of issues from it as the history of Brazil and Art, the planarity of painting, etc.. 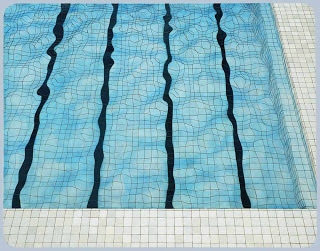 The history of tile dates back to the origins of our own civilization, and can be outlined based on the courses and developments of the tiles, a short history of the relationship between the cultures of East and West, Center and Periphery over the centuries : from Ancient Egypt, Mesopotamia, Persia and Babylon, Islam, Europe, and finally their colonies. 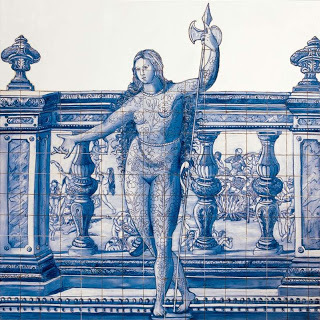 On the European continent will be in Portugal, since the fifteenth century, the art of tiles find their development more full and rich. 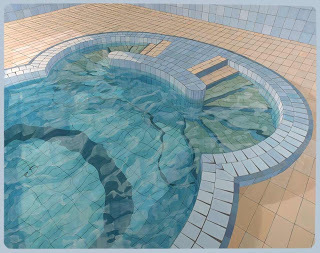 From there was exported, merchandise and later in artisanal and industrial process for our country. 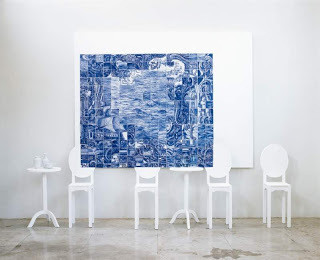 Interestingly, in Portuguese, the word tile, etymologically of Arab origin, contrary to what may seem, give rise to the name of their own color blue as we know it today. 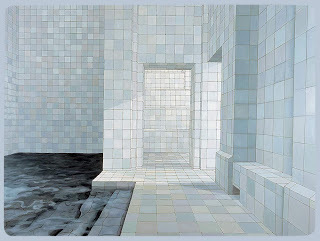 Imbued with this story of tiles, from 1995, Adriana starts working the pictorial issue and physicality of painting and tile work harder in the series “Academic” and “Languages ​​and Cortes.” The tiles would be approached differently in the series “Saunas and Baths” starting in 2001. 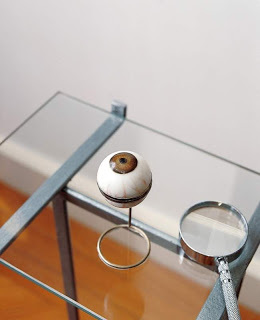 “My function is to put questions to my job, move him to new questions, and I do this by placing elements that interact with each other, trying to make the work shall be the most comprehensive possible. Analyzing my work in a time range, it seems to me they are completely different, but when you trace the journey, there is consistency and the conversation between them. 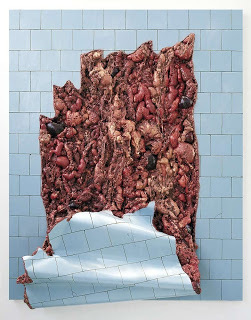 I am surprised by this fact and the amount of elements that comprise the work, which in turn, lead paint to extremes, putting itself to the test. 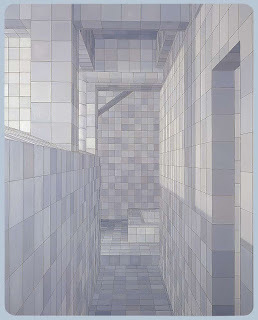 ” Adriana Varejão. 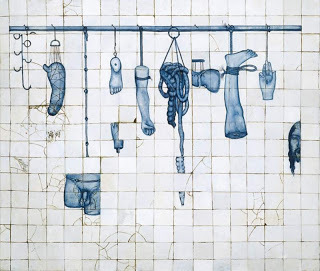 The gallery “Adriana Varejão” in Inhotim Institute in Brumadinho, Minas Gerais was inaugurated in 2009. 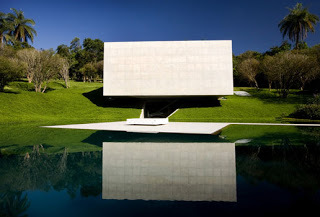 The project is by Rodrigo Lopez Cerviño TACOA Architects, the architecture combines with the paintings and sculptures of the artist in a building as contemporary as the works incorporated on it. 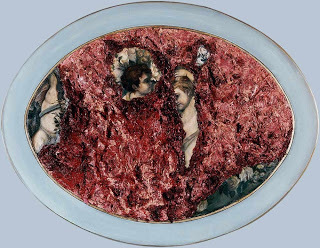 “My work operates with rationality and visceral, predictability and voluptuousness, fundamentally, therefore, with the overlay of opposites.” In death, the fullness of matter, “says Walter Benjamin in “The Origin of the drama of German Baroque”. 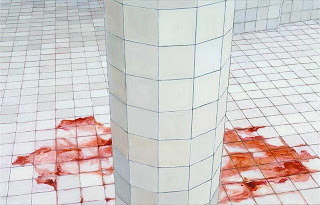 Maybe I operate the corporeality through matter represented in the wound in the flesh “Adriana Varejão said in an interview with Felipe Scovino. 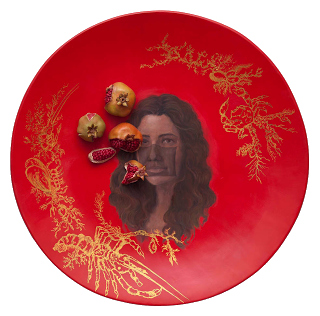 In 2009, she began the series “Dishes ” inspired from the work of the Portuguese ceramist Bordallo Pinheiro (1846-1905). 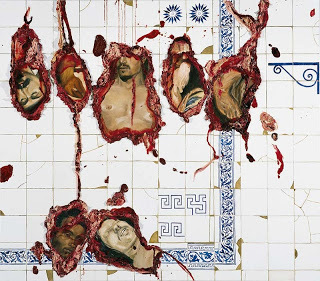 In the same year, she published the book “Adriana Varejão: Between Meat and Seas” organized by Isabel Diegues, was through this book that I became interested in her work and learned behind the poetic of her paintings. 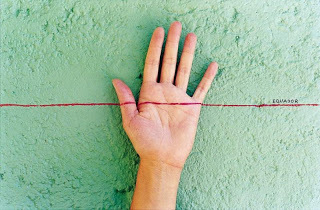 The artist has held major exhibitions in Brazil and abroad as her last retrospective, “Stories on the Margins” at the Museum of Modern Art of São Paulo and of Rio de Janeiro in late 2012 and early 2013 respectively. 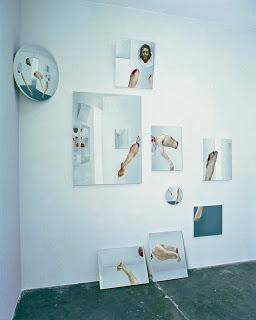 She recently won the Mário Pedrosa Prize of the Association of Art Critics (ABCA) in category Artist of Contemporary Language. She lives and works in Rio de Janeiro, RJ.